Now that Thanksgiving is over, it is officially the start of the holiday shopping season. Finding that right gift for everyone on your list can sometimes be a challenge. But this year how about giving a gift that can provide individuals with a sense of safety and well-being. I’ve compiled 10 Christmas gift ideas that will make this holiday season merry and bright for your loved ones to improve safety, security and ability to cope at home easier. 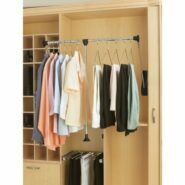 The Pull Down Closet Rod is a perfect solution in a closet for those harder to reach items. No need for a stool, the pull down feature allows for easy access to the hanging items, allowing the user to bring items within reach. These rods come in different sizes. These silicone guards fit around the front edge of oven racks to protect you from painful burns when reaching into the oven. 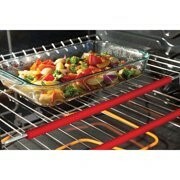 A great safety item for any kitchen with an oven! They work with gas, electric, and larger toaster ovens. Long handled reachers are useful when someone should avoid or cannot bend down to pick up items off the floor or grab something in hard to reach spots. 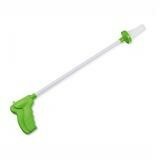 The Critter Catcher stands out from all of the other reachers because it will pick up small and fine objects (safety pins, little pills, thumb tacks, etc.). Having multiple remotes can quickly get confusing, especially for viewers with partial eyesight or for those who have difficulty finding small buttons. 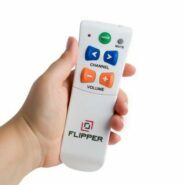 By combining TV and cable/satellite controls into one easy-to-use device, the Flipper reduces demand on caretaker time and gets elderly users back in charge of their viewing experience. This Alexa device with a 10” screen makes it easy to stay in touch. 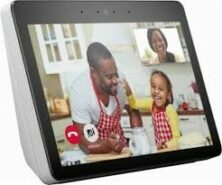 Make video calls to your loved ones with either another Echo Show or with the free Alexa app on your iPhone/iPad. Another feature called “Drop In” allows you to immediately see how they are doing & start a conversation with them. Plus, now Alexa can link with Skype, which opens up video calls to those who don’t have a Show, Spot or the Alexa app downloaded. Reminder Rosie is your own personal reminding alarm clock. 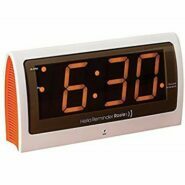 Individuals will never forget tasks again using this voice activated alarm that will remind the user of appointments, medication and any other reminders. Reminder Rosie displays large 2” LED digital numbers and has the ability to record up to 25 personal reminders in a voice of a loved one. This is a great little tool that makes it easy to get in and out of a car. 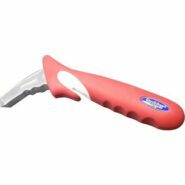 Simply slide the heavy duty steel handle into the striker/door-latch in the car frame for extra support to sit or stand. Because the Handy Bar is stowed in the vehicle, it also comes equipped with a window breaker and seat belt cutter for safety. The MedReady will help eliminate medication mistakes and overdosing on pills. This medication dispenser is a locked device and will automatically dispense medication to individuals up to 4 times per day. When it is time to take the medication, the unit will sound a loud buzzer to notify the individual. Opening the medication door disables the alarm and the individual only has access to those pills scheduled. The MedReady is available in different models. Medical identification (ID) bracelets can be one of the most important items worn for those who have ongoing medical conditions, drug/food allergies, or take multiple medicines. Medical IDs can alert healthcare workers, emergency personnel, doctors or friends/family to critical and personal information, especially in the event one becomes unresponsive or has memory issues. Medical ID bracelets come in many varieties and price ranges; virtually anyone’s needs and preferences can be accommodated. 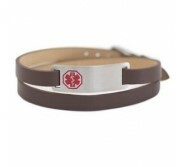 There are also USB medical ID bracelets to store vital health information available. 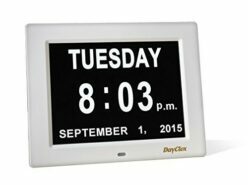 Calendar clocks are an excellent tool for your loved one who experiences cognitive impairments, memory loss or who has impaired vision. These digital clocks clearly spell out the day, time, month and year with no abbreviations used. This makes a great gift for all ages! When it comes to giving a Christmas gift, it’s the thought that counts. And truly, the best gift you could ever give someone is giving them your time. Your time will truly brighten their holiday!